A nice and well-organised home is an important part of the life of every person. It is essential for the well-being of humans to feel good about spending time at home and to relate their places to positive emotions. When it comes to the comfort of a home, there isn't anything like clutter that can really make a place look terrible, unwelcoming, dirty and messy. Want it or not, clutter is an inevitable part of a household. Even the most organised people can sometimes find certain items lying around messily. Living in one place means we create clutter sometimes, even if we don't want it. However, there are ways to cope with the problem and limit the occurrence of clutter significantly, turning the messiest place into a lovely and organised home. Here are some suggestions on how to put your home in order and make the best of your time indoors by preventing annoying clutter. The most essential part of dealing with clutter is to find the right place for every item. The reason why sometimes we are faced with so much clutter is because many of our belongings don't really have a special place to stay. The best you can do in the fight with clutter is to make room for everything, so that every item goes to its own place after every use, instead of being thrown on the table, bed, chair, floor or whatever. Does your towel end up lying on the chair and making it wet every time you get out of the bathroom? Simply place a hanger up on the door of your room and keep it there. Are your shoes blocking the entrance of your house? Then invest in a shoe cabinet and place your shoes in it every time you go in. Is it a routine for you to search for your keys all over your place and never find them on time? Then find them a place near the entrance of your home, so that you don't have this problem anymore. You can find a place for everything if you give it a try and you'll see how much easier and more convenient it is for you. Also, the more organised your place is, the easier it is for you to find the items you need. Cleaning up your place is another essential part of the process of de-cluttering. To clean your place, start off by removing all unnecessary items that you are not planning on using ever again or others that you don't use often and can store away. All that such objects do is to take space and create clutter. Therefore, it's a great idea to simply get rid of them or place them somewhere you won't have to deal with them on a daily basis. Use storage boxes and name each one of them with labels, so that you know what they contain. For example, don't let your Christmas decoration lie messily in the closet but put it in a box to store in a much more organised way. Clean up the rest of the mess by storing different types of objects in separate boxes. If there are things you don't find useful and want to get rid off, you can either sell them (online or at a garage sale) or donate them to charity. It's a guaranteed way to see your place becoming much more orderly a lot faster than you expect. Once you have dealt with all the clutter and you have found a place for every item, it's necessary to make sure you keep it this way, so that you don't have to go through the tiring process of de-cluttering your entire place once again. 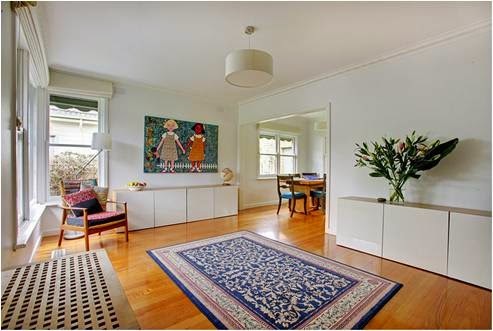 Clean your home on a regular basis or have it cleaned by a professional company like Tidy Cleaners in Notting Hill. Either way, it's necessary for the organised home to be not only free of clutter but of bacteria as well.